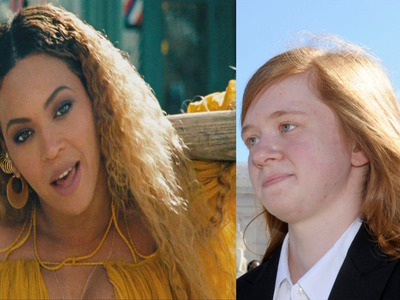 Business InsiderTwitter users used Beyonce lyrics to mock Abigail Fisher. The US Supreme Court ruled in favour of affirmative action at the University of Texas Austin (UT) last Thursday, further validating the use of race in admissions policies around the country. After the ruling, the hashtag #BeckyWithTheBadGrades, a modification of the Beyonce song lyric “Becky with the good hair,” began trending on Twitter. The pop culture reference comes from the album “Lemonade” and refers to the woman with whom Beyonce insinuates her husband, Jay-Z, had an affair. Twitter users began comparing “Becky” and Abigail Fisher, the woman at the center of the Fisher v. UT case. Fisher was denied admission to Texas’ flagship public university in 2008 and claimed her race played a factor in her rejection. Fisher argued that the university denied her admission in favour of less-qualified black and Hispanic students, which, consequently, violated her right to equal protection under the law. UT has an admissions policy called the Top 10% Plan, which grants automatic acceptance to students within the top 10% of their graduating class into any public university in the state. For the rest of its admissions, UT employs a “holistic” review policy, which includes a number of personal and academic factors, including race. The case scrutinised the holistic elements of UT’s admissions, often used to increase diversity. The “Becky” tweets center on the assumption that if Fisher’s grades were “good” enough that she fell within the top 10% of her class, she would have automatically been admitted to UT. Court documents show that her high school grades were below the average for accepted students. She scored an 1180 on the SAT. UT’s website puts the average SAT score at 1274. She also graduated with a 3.59 GPA. On Twitter, users mocked Fisher’s so-called “bad” grades. The Supreme Court’s ruling last week brought to a close Fisher’s case which had been argued in different courts since 2012. Experts watching the case have argued that the outcome could have a far-reaching effect on the ability of universities around the US to consider race in admissions. At Harvard, for example, an anti-affirmative action group called Students for Fair Admissions filed a complaint against the Ivy League school in 2014, which claims Asian-Americans applicants are held to a higher standard than others and must achieve high tests scores to be accepted.